Update Dec 9th - photos added to the galery PHOTOS. Update Nov 28th - New photos e.g. angry Pouvreau kicked through the wall! On W.Cup in Kranj fight Slovaks without Czechs W.C. The World Champion Tomas Mrazek and Tereza Kysilkova won the Czech Championship in difficulty clibing this weekend in Brno. 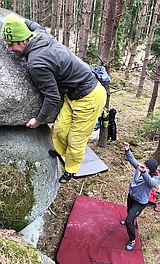 Parallel Czech Championship in bouldering was won by Jakub Hlavacek and Vera Kotasova. Tomas Mrazek was in bouldering the second. The Czech best competition climber Tomas Mrazek was on Sunday the first in duel category and the 2nd in difficulty climbing o famous competition Rockmaster held this weekend in Italian Arco. The date of Boulder series comp was changed! The competition of World Cup in difficulty climbing in Prague (CZE) has been postponed for one week. It will be on October the 11th and 12th 2003. International Council for Competition Climbing (ICC - UIAA) accepted demand of Czech side.